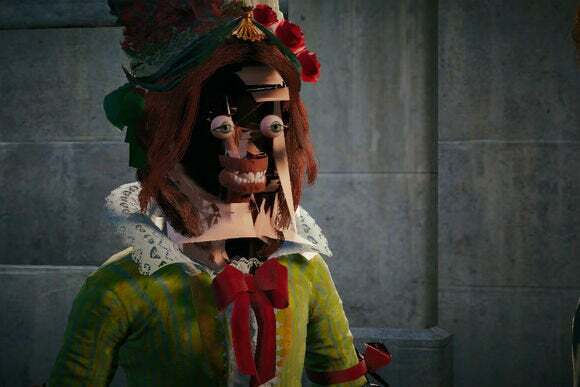 Ubisoft is scrambling to fix a long list of game-breaking bugs in Assassin's Creed: Unity, including one that replaces characters' faces with something out of a horror film. Since the game launched on Tuesday, players have flooded Ubisoft's forums, social media accounts and product pages with complaints. Frame rate issues and crashes abound on both the PC and console versions, and problems with Ubisoft's servers prevented players from enjoying the game's online features at launch. But the strangest problems of all involve characters taking on a ghoulish appearance. As Steam user Retro_Apocalypse has documented, it's possible for characters' faces to disappear, leaving behind only their eyeballs, teeth, gums and hair. Other videos have shown characters floating awkwardly, running in place, and contorting into odd positions. On the official Assassin's Creed blog, Ubisoft claims to have fixed some issues in a Day 1 update, but a laundry list of problems remain. An upcoming patch will address issues with Arno (the main character) falling through the ground and getting caught inside of hay carts, along with co-op session crashes and delays in reaching the main menu. Future updates will address problems with frame rate, matchmaking, Helix Credits, and graphics/collisions (presumably including the frightening examples mentioned above). Ubisoft hasn't given a timeline for any of these fixes. Strangely, a community manager on Ubisoft's forums has singled out AMD CPU and GPU configurations as causing graphics performance issues, even as users of Nvidia graphics cards have experienced plenty of their own problems. PCWorld's Hayden Dingman (who is currently working on his Assassin's Creed: Unity review) is using an Nvidia GTX 760 GPU, and has seen his computer go into a hard lock 10 times over the last two days, among other issues. The entire launch is a mess on PCs and consoles alike, and likely won't be fixed for some time, so calling out AMD in particular doesn't make much sense. In the meantime, you're probably better off avoiding the game until all the issues are fixed. Why this matters: Ubisoft has joined the unfortunate trend of publishers launching games that simply aren't ready for primetime. EA's Battlefield 4 and Sim City are notorious examples, and this week, Microsoft has been grappling with bugs and multiplayer matchmaking issues in Halo: The Master Chief Collection. Meanwhile, publishers continue to sweeten the pre-order pot with elaborate bonuses, encouraging players to lock themselves in regardless of the game's quality at launch. It's a broken system, one that won't correct itself until more players learn to steer clear of launch day.